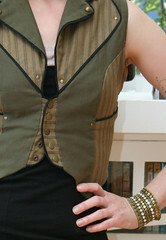 This vest is the one I was trying on when Katy Sagal told me how great it looked on me. I think she was right; it fits me like a glove and is perfect for my style. It doesn't get a ton of use, but I always really enjoy wearing it. Pairing it with these cropped pants and espadrilles turned out to be a perfect combination. Another Sheriff of Matchy-Matchytown-approved ensemble. What is it about these shoes that makes me get all matchy? Its an excellent vest...I'm a fairly new reader so I haven't seen it before. Can it be worn without a shirt underneath? Matchy in the *best* of ways, of course (from a life-long matcher). It's a very cool look, I esp. love the pants. That vest does look like it was tailored to you. Love the matchy and perfectly paired cargos. My limegreen Vogs always make me want to create perfectly matched outfits. I loooove that vest! I've been really into short vests lately and this one is stunning on you! Who knows why they make you match, but it's an cool outfit. And that vest is awesome! Love the vest and shoes combo great outfit! ...I must admit sometimes when I look at your pics I am trying to figure out what books you read. I see a lot of Lonely Planet Guides. That vest is amaaaa-zing, and your ensemble in general looks great. I've always wanted the voice of Leela to tell me I look good in something! This is one of the best outfits you've ever worn. I tried to be non-matchy, but I realized I must return to my matchy-matchy roots and embrace them. I really like an outfit so much better when it matches. Terri: Actually I hadn't really considered that possibility, mainly because it's so short that wearing it without a top underneath would mean a bare midriff -- definitely NOT ok for work, but it would look great at Burning Man! Tina: Those are indeed Lonely Planet guides you're seeing! I like to keep them all together to remind me of all the places I've been. That bookcase is only part of what we've got, and more than half those books are Mark's, so it's a pretty mixed assortment; the bulk of my collection is probably classic writers like Dickens, Hardy, Wilkie Collins, etc. I also love all the Master and Commander books, and am a big fan of Isabelle Allende and Margaret Atwood. I like matchy-matchy outfits when they're neutrals like this. It's more like everything just goes, as opposed to being a perfect color block. You know I love vests, and this one is amazing. All these colours are so beautifully complementary - all hail Matchytown! I'm also thinking that perhaps the pop of color has had its day? In general? For now? LPC: I think you're right; I'm seeing less and less of that look these days.